Kodiak originally came with his sister Kenai from Woburn Safari Park in April 1994, at eight days old. 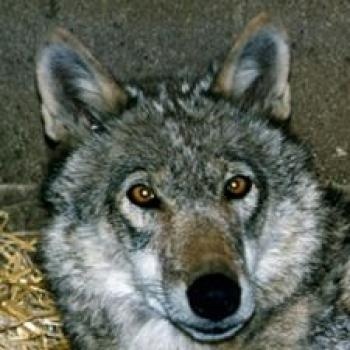 He was a founder wolf of the UK Wolf Conservation Trust. He initially lived with Kenai and an older wolf, Denali. Later as the Trust developed and more wolves arrived, for a time he lived with Kenai, Duma, Dakota, Alba, Lunca and Latea in the largest enclosure. When Kenai was deposed both he and Kenai moved back into an enclosure to live together as a separate pack. 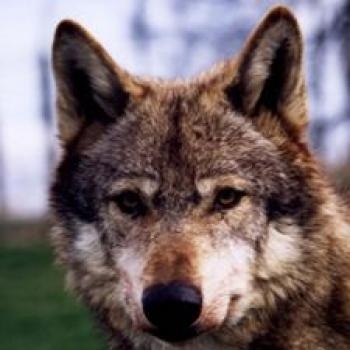 Kodiak was a very impressive wolf and worked until he was around three years old before retiring from public walks due to dominance issues which is normal for mature male wolves. In these later years he would go out for enrichment walks with his last remaining handler Colin Thorne. After Kenai died he moved in with his younger sisters Duma and Dakota. Kodiak first gave us cause for concern in December 2008 when he started passing bloodstained urine. The hope was that he just had a bladder infection, but a week of antibiotics did not improve the problem. By then he was also off his food and looking uncomfortable. He was booked in for tests and a scan of his bladder showed a small mass against the bladder wall. He picked up for a while but unfortunately in early February 2009 Kodiak started to go off his food again and it became increasingly hard to get him to take his meds. He was put to sleep on the 11th Feb out in his favourite part of the enclosure. He is sorely missed.